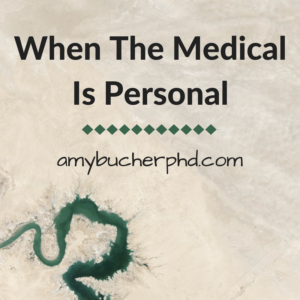 When The Medical Is Personal | Amy Bucher, Ph.D. But consider a seriously ill person, or someone whose quality of life is significantly affected by their condition. That person may be willing to accept a greater risk than the scientific community recommends if a treatment could conceivably lessen their suffering. And that’s the research that Levitan does, looking at what people find acceptable risk for themselves if they are also grappling with a serious illness. His findings are that some people were more open to risk than the scientific community when they weighed it against their personal experiences with severe illness, or against other severe risks. Not all patients have the same risk tolerance as the scientific community, in other words. What I took away from this talk is that we need to consider what matters most to people around their own lives when we think about the medical decisions they might make. And yes, I’m ignoring the thousands of legal issues that physicians and scientists grapple with in terms of making experimental and risky treatments available to patients; I know I am oversimplifying their decision process. Nonetheless, I believe that it’s crucial to consider what the person who is ultimately affected by a treatment wants and values and needs if we are really going to do good in the world. Some people are willing to live with significant impairment if it means they do, in fact, live. Others would prefer to die if the alternative is facing the world with particular losses. And who are we to decide that for them? As health professionals, as experts of any stripe, we are trained to strive for a certain definition of success. But if that type of success translates to an unhappy life for those we claim to serve, have we really succeeded?